Like the smartphone before it, the tablet is blurring the line between consumer toy and enterprise workhorse. Developed to be intuitive, sleek, and fun, consumer technology like the tablet has plenty of immediately apparent advantages over what a corporation would traditionally choose for its employees. It’s no wonder, then, that these consumer tools leak over the corporate boundaries—despite the security flaws that come with something designed to play games and read restaurant reviews instead of analyze customer data. So how do you promote user productivity by allowing tablets, without creating a gaping hole in security? Wave-managed tablets give users the streamlined, intuitive experience they’ve come to expect from consumer technology. Wave-managed tablets give IT decision-makers the peace of mind of knowing their tablet deployment conforms with enterprise security best practices. And for IT staff, Wave-managed tablets build on tools they already know (i.e. Microsoft Active Directory). …but the device is secure. IT staff can remotely initialize and manage devices to ensure only authorized users are accessing networks and resources. They can monitor for malware attacking in pre-boot. They can provide audit logs to prove compliance and data encryption in the event of a lost device. In short, they can do everything they would do with an enterprise laptop. Wave software starts security with the device by using security tools embedded in the hardware of the device, improving operating system performance and taking advantage of tools you already have. Wave integrates with Microsoft DirectAccess and is compatible with all Windows 8 Pro tablets (available from Acer, Dell, HP, Lenovo, Microsoft, and Samsung). 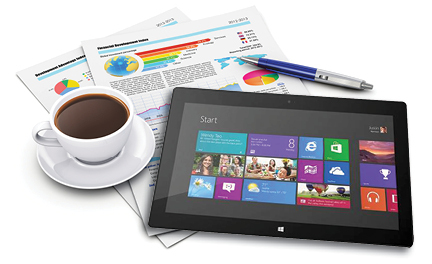 With Wave-managed Windows 8 tablets, enterprises can extend PC security to tablets without compromising best practices or buying independent Mobile Device Management software.